I’ve been a fan of Orson Scott Card ever since I picked up a copy of Ender’s Game in middle school. Like everyone else who has read it, I dreamed of being summoned up to Battle School and shooting and soaring my way to the top of the Battle Room scoreboard. I would be a toon leader, second in command to the great Ender Wiggin. And when the hour of his greatest need arrived, he would call upon me to fight at his side as a member of his jeesh. Ah to be young again, to dream. The fact is, Card is a master storyteller. My experience with Ender’s Game is not unique. Novel after novel, story after story, Card creates characters who are so memorable, so original, so full of heart, that you embrace them as soon as you meet them and beg them to never leave. Ender, Valentine, Alvin, Sarah, Mack Street, Jason Worthing, and more, all have permanent residents in my mind. Since reading Ender’s Game, I’ve read nearly everything Card has written. And that’s saying a lot. Small libraries could be built that hold only his work. I love his fantasy, his science fiction, his biblical fiction, his short fiction, his contemporary fantasy (yes, that’s different, in my opinion, from traditional fantasy), his plays, his comics … goodness, even his poetry. Even the stories he’s written that he doesn’t like or that he thinks are flawed are favorites of mine. So it should be noted that I approached Empire not as an objective reader, as someone ignorant of the author’s talents and mildly skeptical of his abilities to entertain me. No, sir. I came as a diehard fan. I knew this book was going to be good. And I was right. 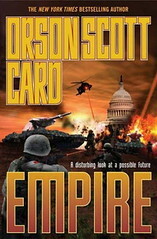 Empire is a pulse-pounding military thriller that demands to be made into a film. It’s so cinematic, in fact, that if it ISN’T made into a film, it’s only because the Hollywood Liberal Left can’t stand the idea of any liberal being portrayed negatively on screen. Villains, you see, must be the conservative right, the “oppressive” Christian majority. The truth is, Empire is wonderfully nonpartisan. Card doesn’t choose sides. There are good guys and there are bad guys. Card does not (as one review I read insinuated) vilify Blue States and wave a flag for the Red States. The premise of the novel is this: in the near future, America experiences a second civil war after the president, the vice president, and secretary of defense are assassinated. The army special-ops officer who was assigned to think up presidential assassination attempts — so that such attempts could be thwarted — discovers that his plan was used to do the dirty deed. In other words, he’s been unknowingly helping the bad guys all along. The bad guys turn out to be members of the “Progressive Restoration,” a group of rebels who believe that the White House was stolen from the rightful party and who now feel it their duty to take it back. The action cranks into high gear when tall, bulletproof machines roll into New York City and begin shooting everyone wearing a uniform. Chaos ensues and readers will find that a long, sleepless night lies ahead. Once the action starts, you can’t put this book down. What’s most amazing about Empire is its believability. The notion of another civil war at first seemed unlikely to me. We’re so much more advanced and educated as a nation than we were back in the 1860s. Times have changed. War means guns, Americans killing Americans. And so much has happened since the Civil War to unite us as a nation, that the idea of picking up arms against each other once again seemed implausible. But by golly if Card hasn’t done it! The case was made, and once the shooting started, it all felt real. A second civil war no longer feels like such an unlikely occurrence. Empire is a dark look into what could happen if the political divide continues to divide. If you’re a lover of thrillers — and even if you aren’t — you must read Empire. It’ll stir you, sober you, and motivate you to put your hand over your heart. A wonderful read. I should also mention that Card shares some of novel’s success with the guys at Chair Entertainment, who approached Card with the idea in hopes of collaborating with him on a game/novel/movie franchise centered around the same idea. I’m not a gamer, but Empire was so engrossing and so full of action that it might make a gamer out of me when the game is finally completed.